If you live in Brookfield, you may already be familiar with how great a fenced in property can look. A fence can make a huge difference in how your entire property looks, as well as the functionality of it. You can use a fence for a variety of different reasons. They look great, they will help keep your pets in and other animals out, and they will prevent trespassers from walking through your yard. There many other benefits of having a fence in Brookfield, which is why they are so prevalent throughout our area. There are many different types of fences that we can offer you. Depending on your specific property needs, we will be able to match you with the perfect type of fence. Below, we will go into more detail about the types of fences that we offer and what you may want to consider for your property. Wooden fences are one of the more common types of fences that you will see throughout the Brookfield. They are simple and they stick to the basics. Many people choose wooden fences because of how beautiful they look on their property. There are other great-looking types of fences; however, it is hard to match the look and feel that wood provides. 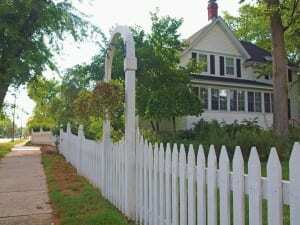 If you want that classic white picket fence around your home, a wooden fence is the right choice for you. Vinyl fences can also be commonly found throughout the Brookfield. They are stronger than wooden fences and easier to maintain. They have a nonporous surface which prevents moisture or dirt from penetrating through it. This keeps it extremely easy to clean. In most cases, simply waiting for the next rainfall is enough to keep your fence looking clean year-round. Many people love vinyl fences because of the look that they create, as well as the longevity that they offer. Vinyl fences come preinstalled so they go up quickly. If you need a fence put up but you don’t want to have to deal with a labor crew spending weeks in your house, we will be able to put up a vinyl fence within days. Chain link fences have more of a utility purpose. They are cheap solutions for property owners that are more concerned about the function of the fence than appearance. You will often find Chain link fences on commercial properties, public spaces, and some residential properties. If you are looking for a low-cost way to put a fence up around your residential or commercial property, a chain link fence may be a great option to consider.